Eloise McGarry (Kendrick) is in a difficult place: with her best friend Francie’s wedding fast approaching, her boyfriend (and Francie’s brother) Teddy (Russell) dumps her, but she still receives an invitation to the wedding. She decides to attend but at the reception, finds that she’s been allocated a seat at Table 19, the furthest table away from the bride and groom’s. There she meets Bina and Jerry Kepp (Kudrow, Robinson), diner owners who know the groom’s father; Jo Flanagan (Squibb), who was Francie’s first nanny; Renzo (Revolori), whose parents are acquaintances of the groom’s family; and Walter (Merchant), a cousin of Francie’s father. Together they are the Randoms, the people who don’t fit in with any of the other tables. And as Jerry points out, it’s the table nearest the toilets. As the reception gets under way, Eloise and Teddy argue over her being there, Renzo reveals that his parents have pushed him into going in order to meet a girl, Walter reveals a criminal past, Jo reflects on the good times she had as Francie’s nanny, and Bina and Jerry’s marriage shows signs of being under strain. As they learn more and more about each other they begin to find common ground, and band together when it’s clear that no one else at the reception will miss them or engage with them. A stranger (Cocquerel) makes a brief but telling connection with Eloise, Jo persuades most of the group to take medical marijuana with her, Bina surprises Jerry with the real reason why she agreed to attend the wedding, Renzo makes increasingly inappropriate overtures to one of the younger female guests, and Walter throws caution to the wind and comes out of the shell his family have imposed on him. By the end of the night, all their lives will have changed, and mostly for the better, with Eloise making a very big decision, and her actions emboldening everyone else who was assigned to Table 19. 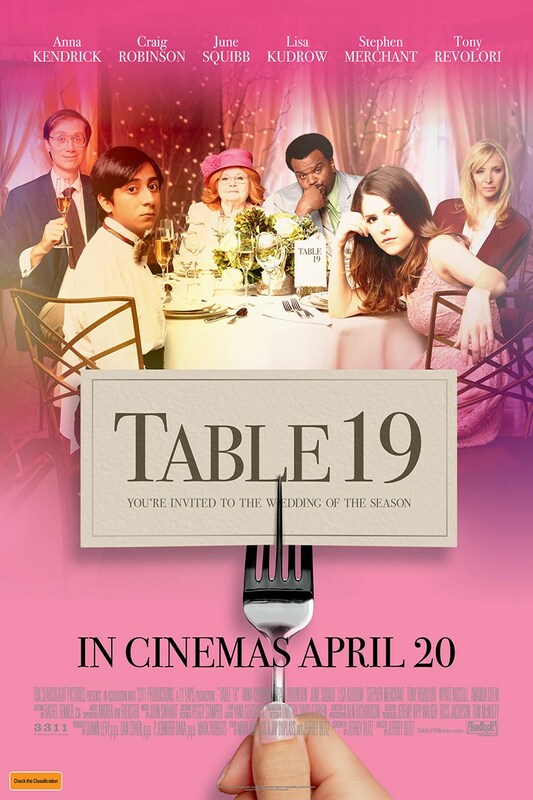 On the face of it, Table 19 has all the hallmarks of an amiable comedy of manners that opts for easy laughs and doesn’t try too hard to entertain its audience. And on the face of it, that’s entirely true. For the most part, the movie is entirely predictable, plays it safe in terms of characterisations and its by-the-numbers storyline, and offers little in the way of wit or sophistication. Viewers who like this sort of thing will be able to guess who Eloise ends up with right from the start, and there are several scenes that exist just to provide unnecessary exposition instead of pushing the various subplots forward. Some of the movie is also unbearably trite, and there are moments where director Jeffrey Blitz – making only his second feature after Rocket Science (2007) – seems unable to combat the curious sense of inertia that settles over the movie and halts its momentum. But buried amongst all the familiar rom-com tomfoolery and wacky behaviour of Kendrick et al, there’s a relationship drama unfolding that perhaps should be the focus of an entirely separate movie. When we first meet Bina and Jerry they’re sitting in adjacent booths in their diner, and with their backs to each other. They bicker about attending the wedding, and conclude their bickering by giving each other the finger. It’s amusing (to a point), but an early indication of the disparity that’s grown to the fore in their marriage. Jerry is supremely confident about most things, while Bina is subdued and quick to challenge Jerry’s assertions. As the evening draws on, we see how unhappy Bina is, and how oblivious Jerry is to her unhappiness. At one stage he tells her he hasn’t changed, as if it was a badge of pride. But Bina’s argument is much more succinct: if he believes he hasn’t, then why is she so unhappy? The only real dramatic element in a movie that tries hard to make a virtue of being twee and genially subversive at the same time, Bina and Jerry’s fractured marriage is also the only element that is likely to engage the audience and offer any real reward or satisfaction. As the couple-at-odds, Kudrow and Robinson deliver confident and touching performances, and their scenes together are absorbing for being so different from the rest of the movie (which is a good thing). It’s a pleasure to see two actors who are known more for their appearances in comic roles, commit so completely to examining the interior lives of two supporting characters, and achieve so much in the process. Simply put, they make the viewer care about both of them. Blitz has written the screenplay based on a story he’s collaborated on with the Duplass brothers, Jay and Mark. This is likely the reason that Bina and Jerry’s story has such resonance, as the dialogue between the two regularly steps outside the range of a mid-budget, mainstream romantic comedy. It’s a shame then that their story has to rub shoulders with the rest of the movie, and take a back seat to the trials and tribulations experienced by Eloise, and the rest. 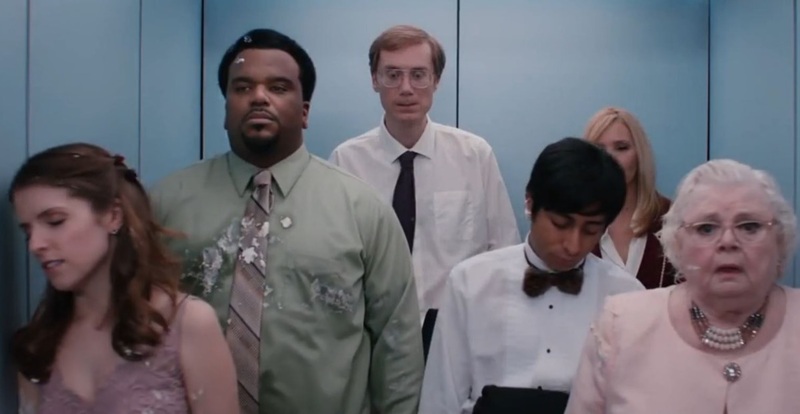 The good news is that the ensemble cast has been well chosen, with all six Table 19-ers (except Kendrick) triumphing over the screenplay’s stock situations and tired characterisations. 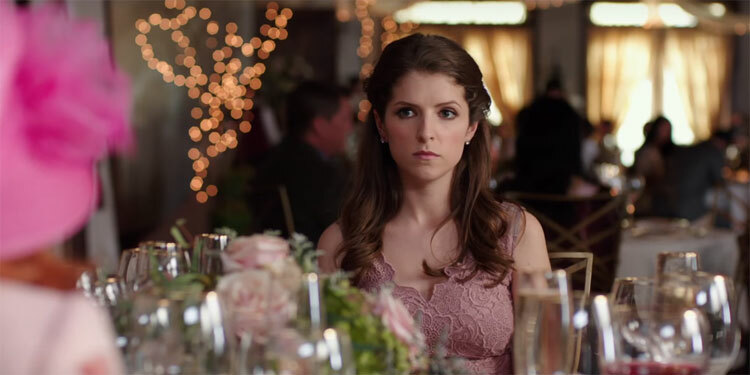 And the movie does at least have its visual moments thanks to Ben Richardson’s skillful cinematography and Timothy David O’Brien’s clever production design, which takes a modern day wedding reception and keeps it looking like a throwback to the Eighties. But these are plusses in a movie that otherwise contents itself with being only occasionally effective. Rating: 5/10 – worth watching for the dynamic between Bina and Jerry alone, Table 19 is let down by its generic rom-com approach and laboured sense of humour; a sharper, more detailed script would have benefited the movie greatly, but as it stands, it’s yet another wasted opportunity released to audiences who will have seen this sort of thing too many times for comfort.